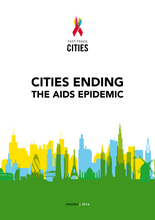 UNAIDS - "Cities have inherent advantages in responding to complex health problems such as HIV. They are dynamic centres of economic growth, education, innovation and positive social change. Cities have large service infrastructures and—through the power of networks—have the potential to deliver services where they are most needed, in a way that is both equitable and efficient while respecting the dignity of its citizens." And read the report here.